We’d love your help. 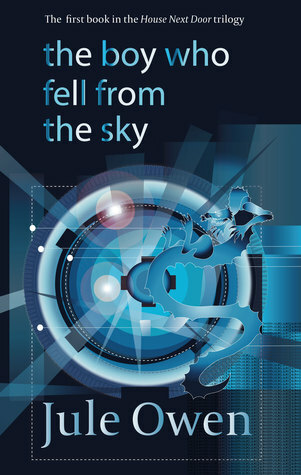 Let us know what’s wrong with this preview of The Boy Who Fell from the Sky by Jule Owen. London is flooded for the fourth time in ten years, on the eve of the outbreak of the First Space War. With the city locked down, sixteen-year-old Mathew Erlang is confined to his house with only his cat, his robot and his holographic dragons for company. Watching from his bedroom window, Mathew becomes fascinated by Clara, the young pianist coming each day for her music le London is flooded for the fourth time in ten years, on the eve of the outbreak of the First Space War. With the city locked down, sixteen-year-old Mathew Erlang is confined to his house with only his cat, his robot and his holographic dragons for company. Watching from his bedroom window, Mathew becomes fascinated by Clara, the young pianist coming each day for her music lesson. But he is not the only one observing her - so is his peculiar and reclusive neighbour, August Lestrange. To ask other readers questions about The Boy Who Fell from the Sky, please sign up. I have thoroughly enjoyed this book and cannot wait for the next installment. The author expertly portrays a future world that is very close to what could happen in reality. Issues we face at the moment, such as Climate change, as well as advances in technology are interwoven into the background of the story and have a ring of truth to them where you can feel the author has done her research well. I felt the theme fairly reminiscent of a futuristic version of 1984 with a twist of the original Pl I have thoroughly enjoyed this book and cannot wait for the next installment. The author expertly portrays a future world that is very close to what could happen in reality. Issues we face at the moment, such as Climate change, as well as advances in technology are interwoven into the background of the story and have a ring of truth to them where you can feel the author has done her research well. I felt the theme fairly reminiscent of a futuristic version of 1984 with a twist of the original Planet of the Apes film (I am imagining the scene where Charleston Heston realizes he hasn’t landed on a different planet, but rather in the future). The story is certainly compelling and the main characters is well drawn out. The only criticism I would have is that the book is almost too short. I can only hope that the next installment in the trilogy will give us a better glimpse of the characters that have been briefly introduced in the first book, including Mathew’s father, as well as his mother’s story. Overall, I would give this book a 4.5 star review, it is greatly entertaining and I had to fight my own tiredness against the desire of wanting to read on. I love this novel. The author has created a convincing dystopian future in which much of London is flooded, there's a semi-totalitarian government and a very clever resistance movement. Global war has extended into space for the first time. There are some truly wonderful visualisations of what the future will be like (the author is a futorologist), and the author has her protagonist and his acquaintances using these in beautiful and magical ways. To this is added a really clever and engaging plo I love this novel. The author has created a convincing dystopian future in which much of London is flooded, there's a semi-totalitarian government and a very clever resistance movement. Global war has extended into space for the first time. There are some truly wonderful visualisations of what the future will be like (the author is a futorologist), and the author has her protagonist and his acquaintances using these in beautiful and magical ways. To this is added a really clever and engaging plot that will keep you turning the pages. The author has pulled off the difficult task of creating and conveying whole new environments (that of London in 2055 and Russia in 2472) in a way that is also incredibly believable and realistic. On one hand this is a “sci-fi” or “cli-fi” novel, and it was fascinating to read the author’s imaginings of future technologies and what climate change would do to London (and also rather sobering, given that the author has researched this topic heavily). And yet it is also a more timeless story about a teenage boy who is not dissimilar from ones we all know – missing his father, hating group activities at school, intrigued by the girl across the street. I loved how the author combined both these strands in the story. Wow, so well written. The first few pages drew me right in. This is an interesting story and one outside of my normal genres. Nonetheless, I totally enjoyed it. While it is YA it does not lack intrigue, mystery, or conflicts. The future worlds and problems were thought provoking. Plus it has a cool futuristic creations. I am looking forward to reading the next book in this series. Desperate for a distraction from the chaos around him, Mathew becomes fascinated by his peculiar and reclusive neighbour, August Lestrange. Mathew begins to investigate Mr. Lestrange, turning to the virtual world of the Nexus and Blackweb for answers. But as he digs deeper, Mathew realises that Mr. Lestrange doesn’t seem quite human. A 1984 for a new generation, The Boy Who Fell from the Sky delves into a future where climate change and technology have transformed the world. It is the first book in The House Next Door trilogy, a young adult dystopian science fiction action adventure. Mathew seems older than he is. Although I was confused by the first few chapters of the book, I found the story interesting and couldn't wait to see what happened next. I love books about the future, especially ones with well thought out worlds and even though this book seemed like one big conspiracy theory, I enjoyed it a lot. I kept saying, okay just one more chapter. Robots are everywhere. It's the year 2055, and there's a war gong on. This was such a good read. I wasn't sure hat I was getting myself into but I'm glad I picked it to read next. It's so exciting and keeps me guessing. I really did not want to put it down. Not only did I like the world it was set in, I really liked reading about the kind of tech they have. It seemed plausible and really helped make me feel like I was reading about something in the future. It's an easy read and I didn't feel too old to be reading it while I worked my way through it. I definitely will check out the next book in the series and recommend you check this book out if you haven't already! Thanks for reading. Check out this review and more at my blog! Plenty of detail and some interesting scenes but, as a whole, it was a fairly dull read. The pace is slow and the ending an inconclusive disappointment. Mostly, the novel felt like a vehicle for the author's views regarding climate change and international politics. Since it is the first in a series, it is possible the sequels develop the story far better but as a first volume, this book did not get me hooked into the series. In the mid-21st century, the Earth has warmed altering climate and weat Plenty of detail and some interesting scenes but, as a whole, it was a fairly dull read. The pace is slow and the ending an inconclusive disappointment. Mostly, the novel felt like a vehicle for the author's views regarding climate change and international politics. Since it is the first in a series, it is possible the sequels develop the story far better but as a first volume, this book did not get me hooked into the series. In the mid-21st century, the Earth has warmed altering climate and weather patterns. Young Mathew Erlang lives in London, which is enduring historic floods and high temperatures. The future is filled with wondrous new technologies but Mathew must spend his days at home, working and playing online. One day he notices his neighbor acting strangely and starts getting a little too curious. He discovers his neighbor is hiding a number of incredible technological marvels right next door! The Boy Who Fell From the Sky is a combination of young adult and climate fiction, but seems better suited for readers on the younger end of the YA age range. Mathew is 15 but largely behaves like a young boy of 10 or 12. He spends his days at home, attending virtual classes, and taking care of his cat. Also, either he is medicated or has a lack of hormones. He spends a fair amount of time with girls his age (albeit much of it is virtual) yet has no "stirrings" so to speak. While the world-building is impressive and detailed, there just wasn't much of a story. The plot unfolds for Mathew with hardly any conflict or tension. He has almost no impact on the plot whatsoever. Despite the spectacular events taking place in the latter half of the book, Mathew is strangely calm, composed, and just goes with it. Why he is so mellow is never explained. Even after the great adventure, he acts as if none of it was a big deal. The heavy political and environmental themes do not fully materialize in this first volume. There is a national security angle that doesn't tie up at the end, there's the virtual world Mathew is building with a Russian girl named Eva, there's his blossoming friendship with Clara, and his travels to incredible virtual worlds through his neighbor's home. None of it reaches any kind of significant conclusion. The author has a talent for description of complex technological features. The book was an easy read but there just isn't much drama. The first book in a series has to hook readers into reading the rest of the series. The Boy Who Fell from the Sky does not succeed. A much more compelling conclusion and more emotion from the protagonist Mathew would've helped, but I think the story needed more tension as well. Innovative, imaginative, tantalising futuristic fantasy which I loved. I read the first two chapters of The Boy Who Fell from the Sky on a train out of London. Somewhat appropriate, as events in the novel would later show. I was immediately intrigued to see where the opening sentences would lead me as I was bombarded by the physical sensations and vivid colours of fast-moving action. I was then quickly yanked from this world neither I nor the protagonist had had chance to figure out into a very d Innovative, imaginative, tantalising futuristic fantasy which I loved. I read the first two chapters of The Boy Who Fell from the Sky on a train out of London. Somewhat appropriate, as events in the novel would later show. I was immediately intrigued to see where the opening sentences would lead me as I was bombarded by the physical sensations and vivid colours of fast-moving action. I was then quickly yanked from this world neither I nor the protagonist had had chance to figure out into a very different world of technology that filled me with a sudden sense of foreboding. House robots and driverless cars gave me a glimpse of a futuristic environment where I half expected a Terminator-type metal spike to protrude from the friendly domestic helper pottering around the kitchen. Relieved that no one appeared to be about to come to a sticky end, at least for now, I read on and was drawn into a fascinating story in a London created by the powerful imagination of Jule Owen. As one of the characters later states: “Any sufficiently advanced technology is indistinguishable from magic.” This encapsulates what I love about the book as it satisfies the need for intrigue and interest future tech can provide along with my secret urge for a little other worldly, borderline magic, (almost) inexplicable stuff! This novel gave me interest on many different levels from individual to worldwide; from everyday London landmarks I recognise to a London I hope never to see. As well as being an excellent story to read, there is a serious and sinister thread running throughout which I see as a clear message to all of us to clean up our act before it’s too late and we totally destroy the beautiful place we inhabit and exchange it for somewhere I would never wish to travel to. The somewhat scary part is that 2055 is really not so far off. Yet I’m a cup-half-full person and I love the optimism embodied in the idea that “there is something sublime” in every one of us. I may be uncomfortable and disturbed by this future London, just about recognisable as a version of the London I was whizzing in and out of as I read this book but I am left with a feeling that through the action the novel’s main characters are taking, there is still hope for all of us. As they say in the later chapters: “The proper place for people is under the sky, not in tunnels and caves.” Let that be a warning to us. But don’t let that spoil our enjoyment of this thoroughly entertaining book which was a joy to read. So glad I have already downloaded the sequel! This book is one of the best dystopian type novels I have read in awhile. It also incorporated the time travel element in a really inventive way. Time travel has been written and rewritten about and can make a person sigh sometimes at how often the same themes or methodologies are used. Not in this book though. The technology in this book is awesome. If I'm still alive in 2055 I hope we have some of the cool tech described in this novel. Especially the holographic dragons. I also really enjoyed h This book is one of the best dystopian type novels I have read in awhile. It also incorporated the time travel element in a really inventive way. Time travel has been written and rewritten about and can make a person sigh sometimes at how often the same themes or methodologies are used. I also really enjoyed how climate change is brought to life in this book. It's a very real issue that can and will affect all of us in our lifetimes. The descriptions are well done and on par with what I know of the climate models predictions. The governments reactions to these climate situations were also very believable. Based upon how we have seen governments around the world react when any type of climate disaster has struck, I would say this book accurately portrays the type of lock down curfew that could be initiated. The pacing in this book was perfect. There was enough explanation to hook you into each new situation and acclimate you to the world the characters live in without info dumping all over the place. All of the characters are interesting and connected. I like how it all makes a web in a way. This was very well-written. In a way it felt like two books in one--two stories--a slightly futuristic start to WWIII that feels very possible and a far-future--400 years down the road that feels like something else altogether (don't want to get too spoilery). I was completely pulled in and loved it. My only complaint is it felt like only part of a book--it is amazing as a set-up and I definitely want to read more but I feel a bit manipulated on that front. Something bigger should have been woun This was very well-written. In a way it felt like two books in one--two stories--a slightly futuristic start to WWIII that feels very possible and a far-future--400 years down the road that feels like something else altogether (don't want to get too spoilery). I was completely pulled in and loved it. My only complaint is it felt like only part of a book--it is amazing as a set-up and I definitely want to read more but I feel a bit manipulated on that front. Something bigger should have been wound up so it would feel like it stood alone. I know it's hard to do with a story that is told in a trilogy form but I would have been more satisfied if it had managed. I am in the middle of the book but I couldn't stop myself from taking a moment and recommending it! It's an absolute must to read for everyone interested in the future of the world and wondering, what's going to happen next. I feel like writing down all the brilliant (and sometimes crazy) ideas and see if they are going to come true in the next 5-10 years! Great work, thank you for sharing your work with all of us! This is a wonderful young adult book that seamlessly brings together science fiction, discussion of the environment, and classical music. It tackles some serious issues in a highly accessible way, and I recommend it for both teens and adults. I look forward to reading the future installments in the trilogy! Very interesting read! There wasn't as much action as I had expected. However, the unpredictable plot kept me wanting more. My curiosity concerning what was to come made it difficult to put this book down. I can't wait to read the next one in the series! Not bad...interesting and intriguing, but a tad too long for my liking. I do a lot of reading for authors asking me for reviews. I actually can't remember if this is one of them. But I don't think so. This is a genre I would have chosen. And it was very interesting. But it didn't leave me feeling I HAD to continue with the series. Take that how you want. Good or bad. I liked that. I like that it's futuristic and has an exciting and what I think might one day actually be possible. I love technology myself. And I think this was very well done. I highly recommend if thi I do a lot of reading for authors asking me for reviews. I actually can't remember if this is one of them. But I don't think so. This is a genre I would have chosen. And it was very interesting. But it didn't leave me feeling I HAD to continue with the series. Take that how you want. Good or bad. I liked that. I highly recommend if this is your type of genre. I'd call it a nice mix of futuristic, dystopian time travel. And the global warming being human-caused bit didn't bug me as much in this one as it does in so many. For some reason, the author's voice didn't over-ride the characters and feel like a political agenda like far too many do. I appreciate that. There's little I hate more than hearing an author's political opinions in a book. This one didn't get there. I didn’t k ow what I was getting into when I stated this book. I thought the title was intriguing which is why I got it. The first chapter was confusing enough to make me keep reading but then I was in a completely different world then when I started. I loved both of the worlds created in this story! Very fascinating and well-written. I have so many questions right now so I’m going to go get the next book!! This book had a weird start then turned interesting. Then it got a little strange again. Finally, it got exciting and interesting and things started to come together but still stated illusive. Then it ended. I'm still not sure if I really enjoyed it or not. It started out interesting, but then turned preachy about what I would call politically correct subjects. Like a whole chapter before returning to the story. It was a total turn-off for me. The plot was interesting but it was more than half way through when the plot really started. Then it just ended. I know it is a series but this was not close enough to a complete story to make me want to continue. A boy falls into a forest. This reminds me of the opening to Predators. Then we follow the goings on (not really exploits) of Matthew Erling Erlang in the not too far future. London has been flooded in parts, and this has caused day curfews to be put in place except for a select few people. Matthew's mom is one of those people that has to leave for work every day (in a hired car), but Matthew has to stay home and do his school work and attend class and lectures virtually. And then things get bizar A boy falls into a forest. This reminds me of the opening to Predators. And then things get bizarre. There were many cool technological advances that appear to be where we are headed. How cool would it be to program a couple of dragons that are pretty much autonomous, at least in the VR world in which they are created? 3D printing is ubiquitous and capable of more than just the plastic-type material available now. This is exciting to read and imagine! Less exciting is the governmental parties making plays for things and using tragedy and disaster to their own ends. That could never happen in our world, right? When I started this book I was worried I wouldn’t enjoy it as instantly I got the impression the author was more interested in describing the future technology in this world. Rather than leaving the impression this technology was ubiquitous the characters seemed to speak a lot about these things as though they were as novel to the characters as they would be to us. However, having said that as the story unfolded I did really like it. London in this book is a flooded, polluted and heavily policed When I started this book I was worried I wouldn’t enjoy it as instantly I got the impression the author was more interested in describing the future technology in this world. Rather than leaving the impression this technology was ubiquitous the characters seemed to speak a lot about these things as though they were as novel to the characters as they would be to us. However, having said that as the story unfolded I did really like it. London in this book is a flooded, polluted and heavily policed city where the central character, Mathew Erlang, finds that the city is now under an all day curfew. He becomes bored and takes an interest in his curious neighbour, Mr Lestrange. When his cat escapes the house, Mathew climbs the wall onto Mr Lestrange’s conservatory where he falls through into the room below. The house is strange and when Mathew tries on what appears to be a standard VR helmet, he finds himself falling through the sky into a tropical forest in far future Siberia. He is captured by soldiers but escapes thanks to a mysterious people who live inside a mountain. London in 2055 is coming apart. A terrible flood has destroyed many homes, setting off an all-day curfew with few exceptions, and people who can afford it only travel with armed guards, while others live in hasty shelters or on roofs. Rioting and unrest abounds as the government tightens its restrictions in the name of safety. Sixteen-year-old Mathew Erlang is one of the people confined to his house, trying to keep himself entertained by watching the people in the houses around him, and tinkerin London in 2055 is coming apart. A terrible flood has destroyed many homes, setting off an all-day curfew with few exceptions, and people who can afford it only travel with armed guards, while others live in hasty shelters or on roofs. Rioting and unrest abounds as the government tightens its restrictions in the name of safety. Sixteen-year-old Mathew Erlang is one of the people confined to his house, trying to keep himself entertained by watching the people in the houses around him, and tinkering with his holographic dragons. And then he notices something isn't right with his neighbor Mr. Lestrange, and as his attempts to find answers are foiled again and again, he takes a risk which sends him to the most unlikely place--the future. Jule Owen was born in the North of England and now lives in London. She spent many years working in online technology, latterly in the video games industry and is fascinated by science, technology, futurology and terrified by climate change.